I often hear people say they’d love to buy a drone, but the cost is a barrier. Apparently, Parrot heard this too and responded with a couple of new minidrones that are affordable and just as impressive as the more expensive models. The Mambo and Swing are Parrot’s two new minidrones that will be great starter drones this holiday season. I had a chance to test out the Swing and found it to be easy to fly and very stable. 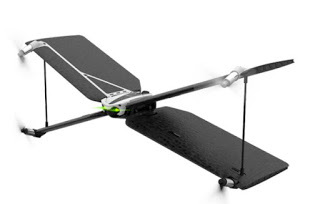 It truly combines the best of a quadcopter with the power of a plane. Swing is the only plane with autopilot and a vertical take-off and landing mode. With the Parrot Flypad controller, it’s simple to fly with ultra-precise control.